A Tiny Hole in the Sand Ain’t Always an Ant. 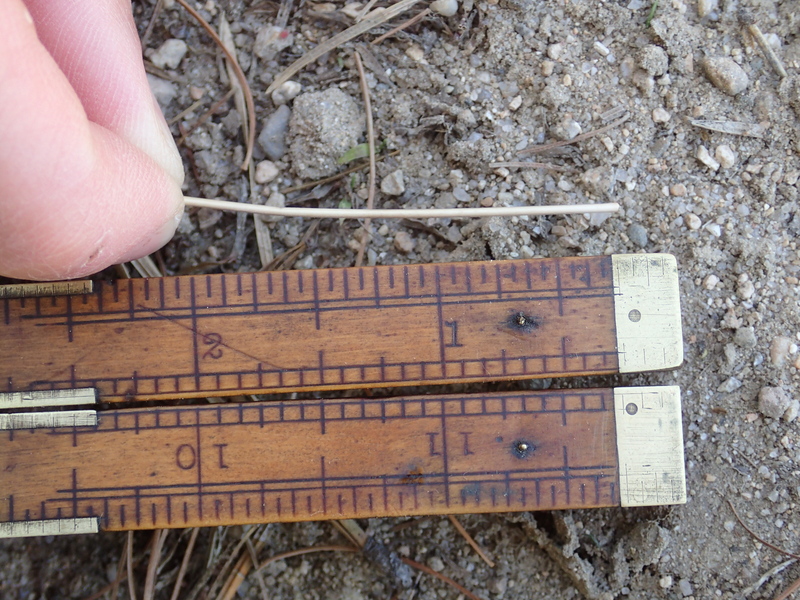 As a kid I saw ant hills everywhere, even in cracks in pavement. Since then my understanding of what a little hole in the sand could be made by has broadened tremendously. Here are a few examples of different creatures that make holes in the sand. Above are tiny pits in a protected spot under a shed roof. Other than demonstrating how long ago the rototiller was used, these little pits can lead us to the amazing creature pictured below. 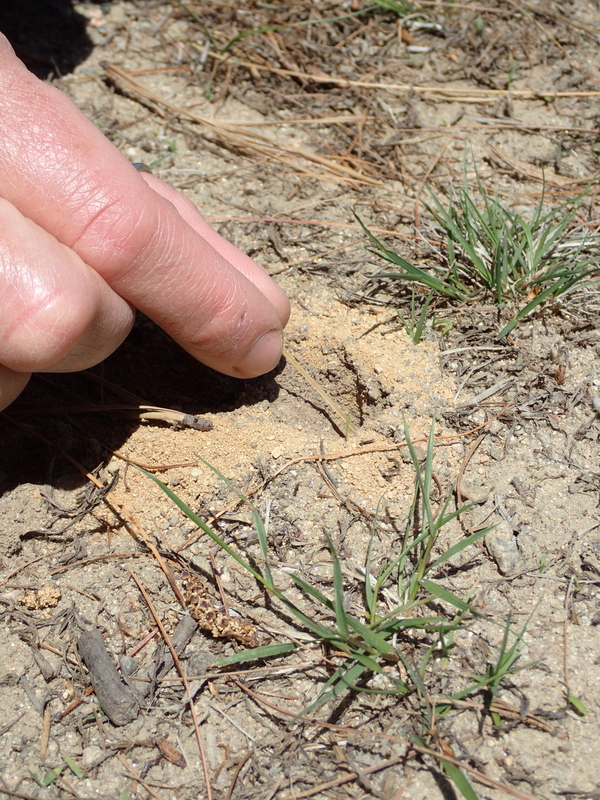 Antlions dig their pits as a trap for ants. They back down into the earth and flick sand up at any ant that enters the pit, making it impossible for the ant to do anything but fall deeper in. 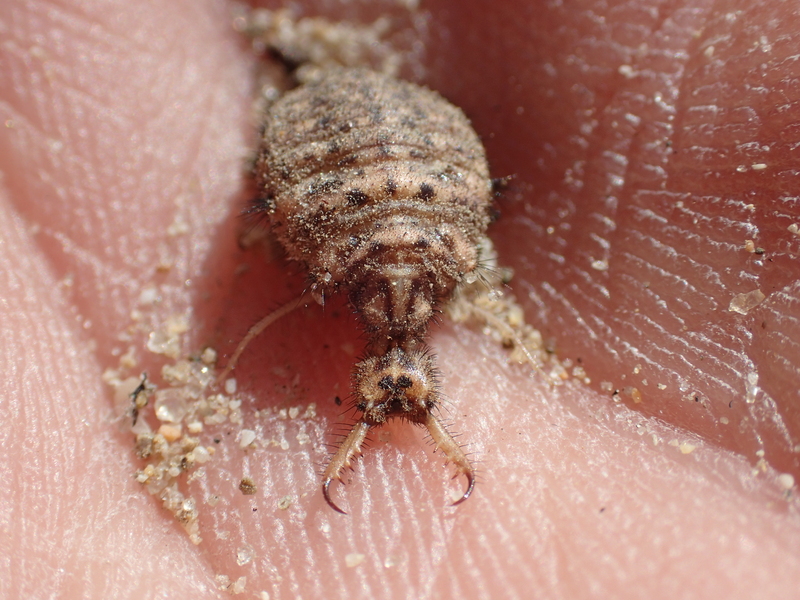 The antlion, waiting at the bottom, then grabs them with those big mandibles and its all over for the ant. Antlions are the larval form of what are known as lacewings, which somewhat resemble a dragonfly. While antions create an inverted version of an ant hill, these next examples do have somewhat of a mound around them. 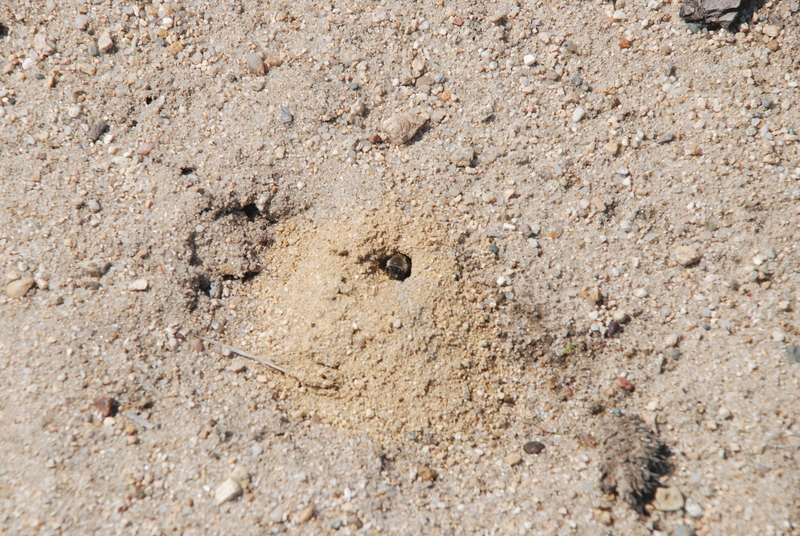 The biggest difference between this and the ants is a much bigger hole which is not always in the center. 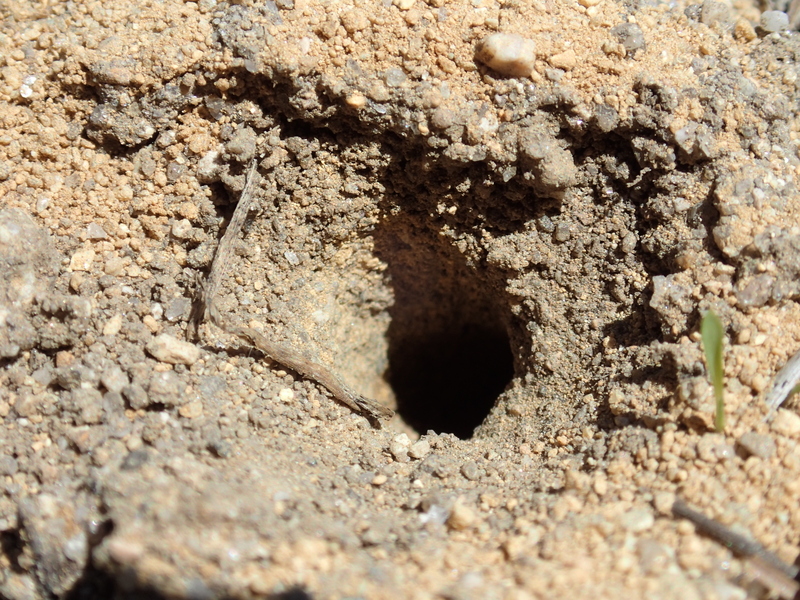 Many species of solitary bees and wasps create these holes. I find these in colonies in open sandy ground without any real protection from disturbance. In the above picture you can see a bee coming out of the hole. 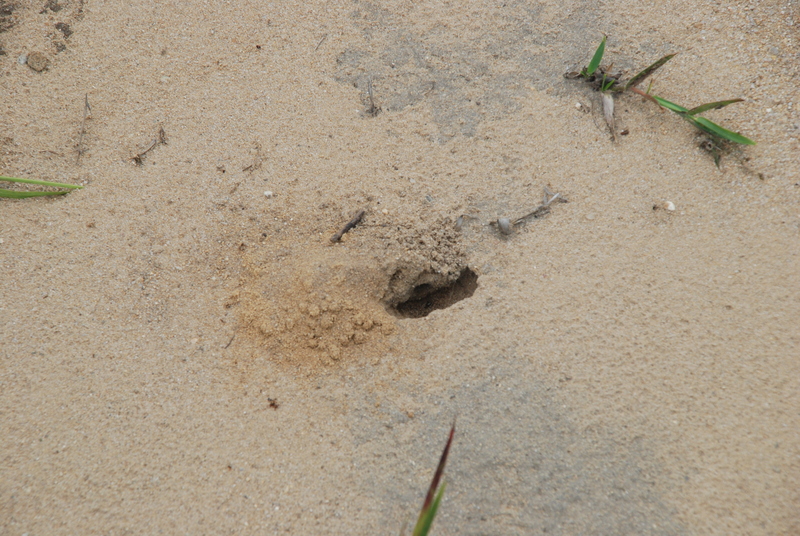 The below pictured holes are more indicative of the solitary wasps, with the sand pushed out in one direction. In this picture a “pathway” was created in front of the hole. We tested the depth of a few of these holes and found them to be around 2 inches deep. They could of course have changed angle and gone further down. Below is a closeup of one of the suspected wasp holes. 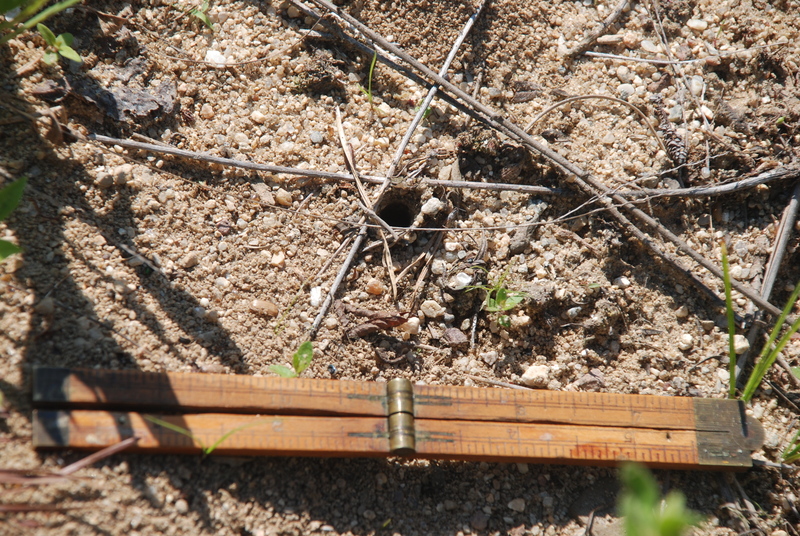 Many kinds of wolf spiders burrow, some make these turreted holes, using twigs, pebbles and spider silk. 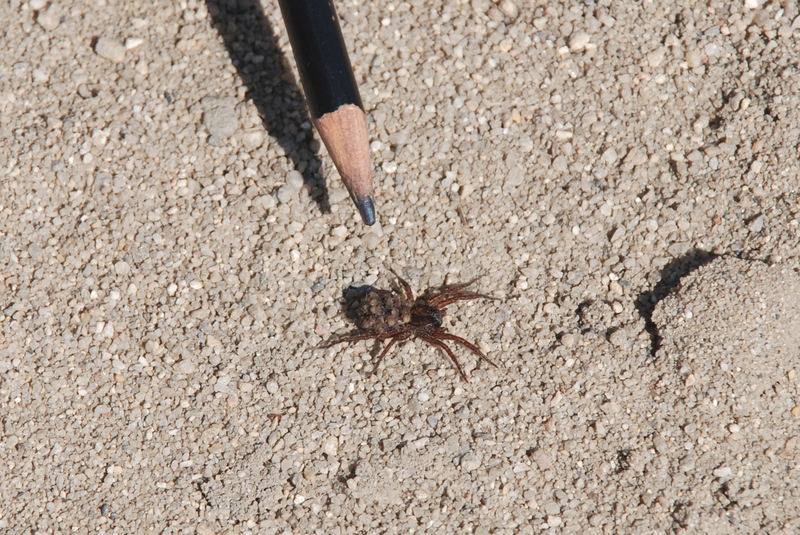 The wolf spider pictured below was walking amongst several of these spider holes which circumstantially indicates it may be of the borrowing wolf spiders (Geolycosa). It is carrying its young on its back. 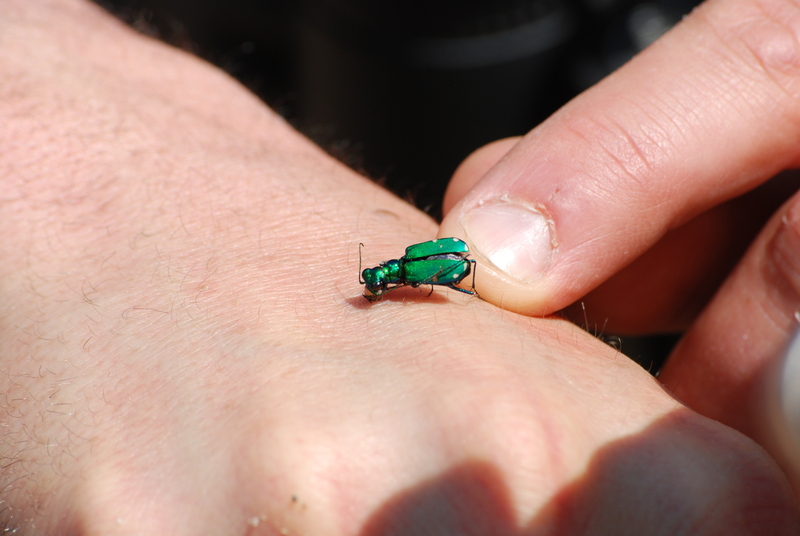 This beauty is a Six Spotted Tiger Beetle. Its larval form digs vertical shafted, very clean holes. 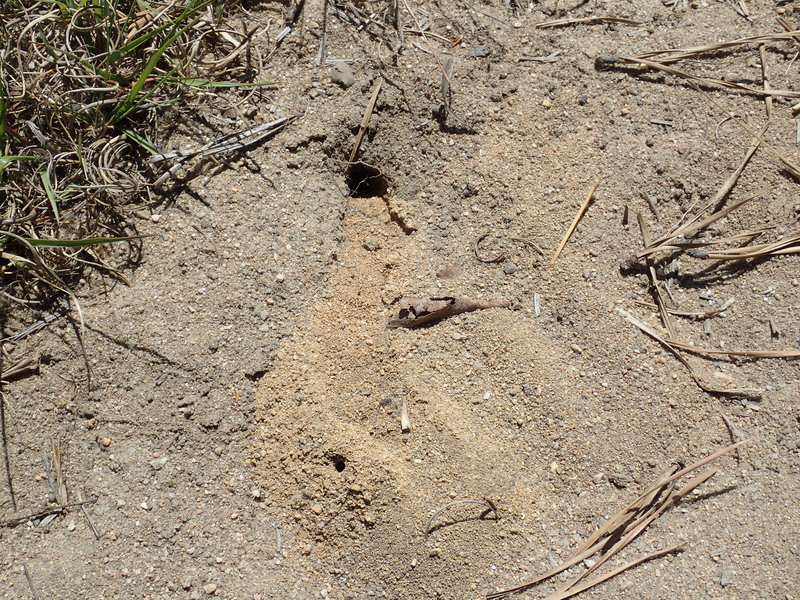 The adult form (pictured above) digs this hole below, more of a shallow slot really, as a shelter. As a kid I was not much interested in insects and spiders until I learned they could build things. Turns out they build all sorts of thing including these burrows and tunnels and its was all right under my feet. ← Cow-bes or Phoeb-birds? Brood Parasite under the deck. Nice article i’ve read about two insects that I have never seen here!